Uncharted: Board Game is a card-based treasure-hunting adventure. Players each take the role of a headline character from the Uncharted series and spend their time searching for ancient artifacts and shooting at bad guys. Lots of bad guys, actually. Discovering artifacts and dispatching these villains rewards Victory Points, and whoever has the most of those at the end of game (or whoever is left standing, if players start dropping like flies) is the winner. Pretty generic set-up, right? Nothing overly complex or innovative at the upper level here, so we’ll have to dig a little deeper. 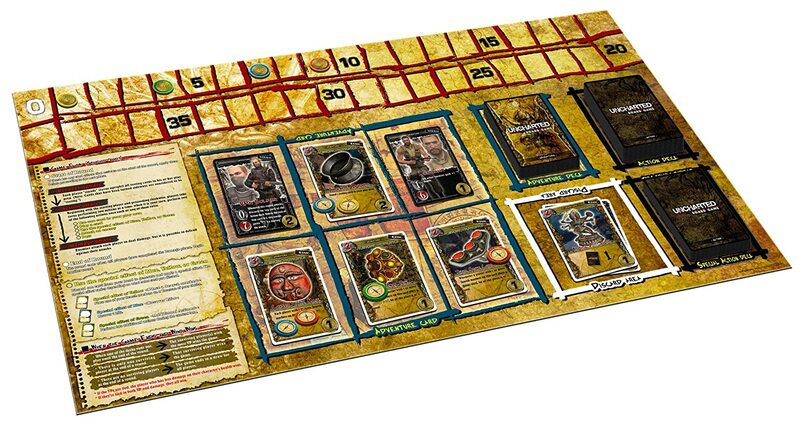 As mentioned, Uncharted is a card-based board-game. I want to stress this point pretty well, here. It’s core gameplay mechanics more or less orient around the drawing and playing of cards, so if you are the kind of player that can get easily frustrated by the occasional bad draw, this might not be the thing for you. But if you like board games that mix card-based mechanics like these, keep reading! Cards represent basic actions that may be taken during a player’s turn. Players collect cards in their hand and play them “down” to the board, where they can be activated repeatedly. The more cards a player has “down” on the board, the more actions he or she can reliably take. Every player starts with four basic cards “down” that allow them to search for artifacts, draw a card, do either/or by inflicting slight damage upon their character, or engage in combat. To start the game, players are each given a hand of three cards from the Action card draw deck, and that’s it. Just those three cards in your hand and the four starter cards on your board. From that point on, players are never given anything. The game owes them nothing and it gives nothing. If players want to get more cards in their hand – and trust me, they do – they must discover action cards that allow them to do so. Now that the players are equipped, six random cards are drawn from a separate deck of cards called the Adventure deck and placed on the game board. These cards are chock-full of artifacts and bad guys. Discover or dispatch one of these cards from the board, and another is drawn immediately to take its place. Once all Adventure cards are gone, the game is over. Turns take place in rounds. Every turn, a player must perform two actions. This is where those “down” cards come in. Most down cards allow you to perform the action listed on the card by tapping it (called “resting” in the game, but same mechanic). Players may also “buy” new down cards from their hand (I’ll talk more about this in a moment). Actions are varied, depending on what cards a player owns, but the major actions most players will take involve finding ways to draw more cards, “searching” for artifacts, and using weapons to combat enemies. What is “searching”? Well, every artifact has a required “search” cost in the upper left corner. Searching for an artifact allows a player to place a discovery token on it. Once the artifact has enough combined tokens from any and all players, it is then discovered. The artifact is removed from the board and awards Victory Points to the player with the most tokens on it (or if there is a tie, each player with the most tokens). Most artifacts also have a special effect that is awarded to the players that searched for it, offering an additional boon to its discovery. Combat is simple enough. All enemies have a health score. Every weapon a player discovers has a damage score. If a player attacks an enemy (as an action) utilizing enough weaponry to meet or exceed an enemy’s health, the enemy is destroyed and that players is awarded Victory Points. Players alternate turns, performing two actions each, until a player either has no more cards to play and passes or decides he’s done enough this round and voluntarily passes. Once all players have passed, the round is over and any bad guys on the game board have an opportunity to inflict misery on the players all at once. Then a new round begins, cards are untapped, and the process starts over. And that… well… is that, really. The key component in this game lies with actions. With cards. Players can only perform actions on the cards they have down in front of them, and when you start the game, that’s only those four cards I mentioned before (and one of those is a pop-gun that does little more than tickle most bad guys). It’s not much to go on, leaving players with those three cards they drew to start the game. Players may purchase cards from their hand, but doing so is painful. Why? Each action card has a purchasing price in their upper-left corner. And the currency used to pay that cost? Well, it’s paid by discarding cards from your hand. Yeah. You buy cards from your hand by discarding cards from your hand. One of the most coveted card types in the game is Run, a blue card that allows you to draw 1 card from the action deck by tapping it. It has a purchasing cost of three, meaning that in order for you to buy this card that allows you to draw MORE cards, you have to discard three cards. Cards you might have wanted to buy as well. Oy. It’s a painful game of sacrifice and patience that requires careful decision-making to be successful. Card count in the hand and on the deck is key. It hurts to run out of available action cards and have to pass for the remainder of the round simply because you can’t afford to buy more actions. The one dinky little Run card you’re given in the beginning of the game helps, but it isn’t enough when some of the good action or weapon cards can cost four or five each. In order to do anything, players must establish some kind of card draw engine early on in order to collect enough cards in their hand to purchase actions that will help them further their agenda. So that’s a lot of words so far in this review, and I haven’t even touched on a key component in any review – how does the game play? Let’s get to that part now. Surprisingly, the Uncharted: Board Game, despite being a licensed video-game side product, is quite fun. The card-based mechanic that drives everything is pretty effective at forcing a player to manage his hand as both currency and product. The enemy and artifact variety is quite good (one of the boss enemies is a tank. Yes, a friggin tank), with most cards being fairly unique in the benefit or penalty they provide. The round-robin turn mechanic can be tense towards the end of the round when you’re struggling to find or buy cards that give you more actions simply so you can do more before the round ends and the enemies on the board inflict damage on your character. The play rules are varied enough that players can play the game cooperatively or competitively, with full rule sets for both game types. The rule book even includes recommended deck builds for different player counts and difficulty settings. There are plenty of characters to choose from, and even optional rules that give each character unique abilities that can be used in-game. That’s… a lot, actually, for a knock-off board-game product that you could easily forgive for being a cash-in to the more mainstream video-game. Uncharted: Board Game surprised me. I went into the game expecting some nods to the video-game franchise and simplistic game-play, but what I discovered was a rather rich card game with a fully fleshed-out and tense economy and some diverse objectives. Games take about an hour or so typically, but the games never feel that long. They’re quick, stressful, and rather frantic in the end game when the big bosses come out and players are struggling to heal characters that have been bled a little too much in the hopes of drawing a few additional cards. A real criticism I have with this game is the element of chance in the draws. Yes, it’s a card game, and chance is at the heart of any and all card games. But in a card-based board-game that can take an hour to play, it stings to draw an early hand filled with nothing but four or five cost cards that will never see play while your opponents are slapping down zero-cost cards left and right (even if those zero-cost cards are not very good, they’re still options, and more options is never a bad thing). The game is very unforgiving in its draw mechanic and leaves you to fend for yourself, and while I like that aspect of it, it can be a source of frustration at times. As far as materials go, the cards themselves are typical laminate stock. The board and game pieces are solid enough. I’m not a fan of the generic, card-stock search and life tokens. I feel like the game makers could have gone a step above here and given us nicer pieces to keep track of our life totals and search efforts. But the cut-outs they provided are solid and functional enough. 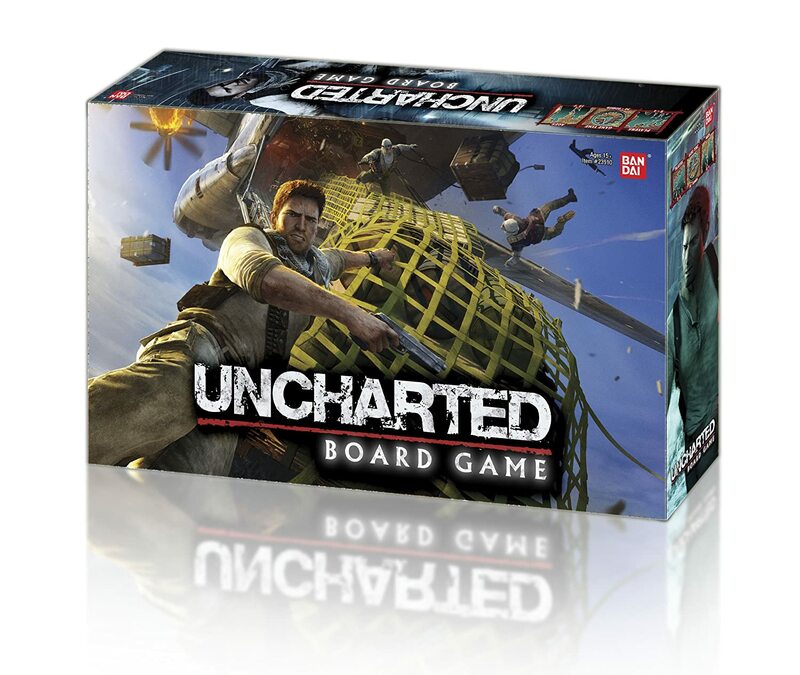 Uncharted: Board Game is a knock-off licensed product, but don’t let that fool you. It has some solid game-play, a breadth of variety, and a hasty pace that’s quite enjoyable and even downright tense at times. I’d recommend this game for four players looking to flesh out a game-day lineup with something that’s rather original, even if the subject matter is the tried-and-true treasure hunting escapade. With the list of different game modes and difficulty levels included in the manual, there’s plenty to keep coming back to in this game, from both a competitive and cooperative level. So grab your .45 Defender, take aim, and start searching through those catacombs. Treasure awaits. A surprising blend of card game-play, deep tactics, and excellent replayability give Uncharted decent staying power in a crowded board-game market. 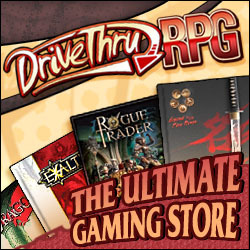 Well worth throwing a couple bucks at for your next board-game party.